Did you know that fields, both electric and magnetic, can store a specific amount of energy? Now you can compute that energy with our energy density of fields calculator. It can be especially useful when describing electromagnetic waves - rays of light. In the context of physics of conductive fluids, energy density behaves like an additional pressure that adds to the gas pressure. In the text below we have described what energy density is and how to calculate energy density in vacuum using energy density equation. Energy density is the amount of energy that can be stored in a given volume (or mass) of a substance. The higher the energy density of a substance is, the greater amount of energy is stored. There are many different types of energy stored in materials, for example: nuclear, chemical, electrochemical, or electrical. the heat which warms us up is from an electromagnetic wave (light), where the energy is stored in oscillating electric and magnetic fields. μ₀ is the vacuum permeability μ₀ ≈ 4π * 10^(-7) H/m. The total energy density of electric field and magnetic field in SI units is expressed in Joules per cubic meter J/m³. It means that every 1 m³ volume of substance stores 1 J of energy. magnetic field of a wire calculator. 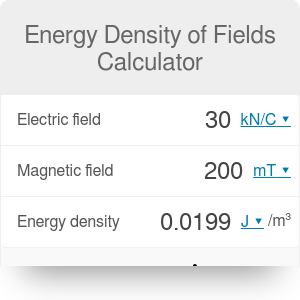 Energy Density of Fields Calculator can be embedded on your website to enrich the content you wrote and make it easier for your visitors to understand your message.